The Route 1 Ride Collaborative is happy and proud to issue the following press release announcing the winning bus wrap design. Please share with your colleagues and other circles. 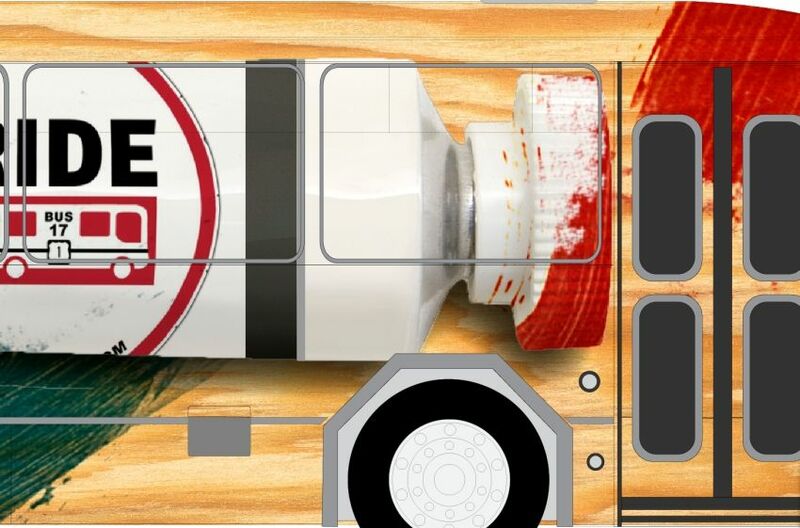 October 23, 2012 — The Route 1 Ride Collaborative is pleased to announce its winning bus wrap design: Jennifer Axner’s “Route 1 Paint Tube”. The Collaborative chose to crowdsource the bus wrap design to increase ridership and awareness of the Route 1 Ride as a way to get around while enjoying the unique charms of visiting, living, working, and playing in the Route 1 Corridor. Three final designs were selected by a jury comprised of Route 1 Corridor County and Municipal representatives; Axner’s fellow finalists included Matthew Gifford and Boshwell Talavera. The final selection was conducted by an online vote on www.Route1Ride.com, conducted from late July 2012 until September 21st, 2012. Axner’s wrap design will be installed on TheBus: Route 17, serving Prince George’s County’s Route 1 Corridor communities from Mount Rainier to College Park; for a period of at least three years, beginning in late 2012. The project is generously sponsored by The Route 1 Ride Collaborative and its Municipal members in recognition of the critical role that the arts play in the revitalization of Prince George’s County and the lives of its residents. My concepts for the bus wrap for the Route1Ride highlight the new and rejuvenated Arts District on Route 1 / Baltimore Avenue. I created two different designs that emphasize the artistic nature the Arts District neighborhoods. Through these design concepts, I wanted to refer to the artists (and their creative processes) that have been attracted to the new Gateway Arts District— as to suggest their creative processes are “splashing” color all over the neighborhoods. Over the past several months, I have seen live painting sessions happening in the window fronts of the Gateway Arts District, as well as new art galleries and the Lustine Art Center, which are clearly visible from the street. There is also a funky yarn store and small urban-arts supply store in Busboys and Poets that are full of colorful products. The Brentwood Arts Exchange studios, museums and galleries are increasingly vibrant and colorful and the University of Maryland has a tremendous Art Department and art students abound. Through my chosen imagery, I seek to refer to the growing dynamic artistic scenes in all of the surrounding neighborhoods and communicate this vibrancy in an unusual way on a large scale. Bus Wrap Unveiling April 29, 2013 at 11:00 a.m.